The proposed laws have already rankled some lawmakers and the Central Arizona Project, setting up what could be a major battle during the 2018 legislative session. Many of the dozen proposals focus on mundane, wonky water details, but have big implications for water management in Arizona’s desert landscape, where sound water policy has allowed the nation’s fifth-largest city to grow. Ducey’s meetings where the potential new laws are being considered are not open to the public, and neither are the proposed legislative changes. However, documents obtained by the Arizona Capitol Times from multiple sources detail the proposals from the perspective of the state. The state wants to be able to declare a drought emergency, allowing for the temporary transporting of groundwater outside of more heavily regulated water locations, called active management areas. Now, the groundwater code makes it illegal to transport groundwater away from its basin if it’s in an active management area. Legislation would allow the director of the Department of Water Resources to approve requests to transport groundwater in emergencies. Now, DWR can do this, but it’s a matter of session law, not permanent statute. The issue is particularly acute in rural areas, where extended drought have hurt groundwater-reliant communities and sometimes result in a water shortage and cutbacks to usage, the state says. The governor would need to declare an emergency due to lack of precipitation or a water shortage, the documents say. The water would have to come from an existing well and would be used for domestic purposes. The Central Arizona Water Conservation District has claimed in a case before the 9th Circuit that it is entitled to sovereign immunity under the 11th Amendment of the U.S. Constitution, something the state argues is inappropriate. In the lawsuit brought by a former employee, CAWCD says it can’t be sued for violating the Family and Medical Leave Act because it has sovereign immunity since it is an “arm of the state.” CAWCD says the immunity would only apply in this narrow circumstance, if the court agreed with its defense. CAWCD also claimed a sovereign immunity defense in a separate case pertaining to Ak-Chin Indian Community water rights earlier this year. The state wants legislation that says CAWCD is not entitled to sovereign immunity under the U.S. Constitution and that CAWCD is not an arm of the state. The state has alleged CAWCD attempted to sell water to a California water district during 2015 without the approval of the Department of Water Resources. CAWCD says it was considering a water storage deal with the Metropolitan Water District of Southern California, and the state was involved in the discussions at one point. But the kerfuffle could lead to legislation. The state wants its water agency, the Department of Water Resources, to be the primary negotiator and approver of any water use, storage or conservation plans. The proposal would require CAWCD to get approval from the department’s director before it starts any interstate negotiating, and the state would need to sign off on any final draft agreement. The state wants CAWCD to go through regular performance audits by the Auditor General’s Office. The proposal would require the auditor to reach out to water stakeholders to identify areas to focus audits on each year. While CAWCD audits its financial data routinely, the proposed audits would probe more into the organization’s work, looking at expenditures and whether the group is serving its intended purpose. As part of the audits, the state posits, the auditor could analyze why the CAWCD hired a national law firm to lobby on its behalf in Washington D.C. at a high monthly rate. Additionally, the proposal says the auditor general would be allowed to attend CAWCD’s executive sessions, which are typically closed to the public. A proposed “Colorado River Conservation Program” would set up a way for Arizona water groups to conserve water as a way to stave off potential future cutbacks from Lake Mead as water levels continue to hover close to a cutoff level. The director of the Department of Water Resources would set up a process to approve water system efficiency projects. The saved water would stay in Lake Mead to boost the water levels and therefore delay any potential cutbacks. The 1980 Groundwater Management Act set up active management areas in Prescott, Phoenix, Pinal County, Tucson and Santa Cruz County, where there are heavier regulations on groundwater use because of increased reliance on the groundwater supply. The 1980 legislation said that by 2025, the active management areas in Phoenix, Prescott and Tucson should achieve “safe yield,” meaning there is a long-term balance between the groundwater used each year and the amount of groundwater recharged in the aquifers. One proposal calls for legislation to make it clear the AMAs for Phoenix, Prescott and Tucson should achieve and maintain safe-yield beyond 2025. And potential legislation would create 10-year management periods for all five AMAs, complete with management plans from the Department of Water Resources. The state also proposes creating a commission made up of groups in the five AMAs to recommend any changes to management plans or goals to DWR. The state says there’s a lack of data on how much groundwater is used outside the more heavily regulated AMAs, meaning it’s unclear how much groundwater is actually pumped statewide at any given time. A proposal calls for measuring and reporting groundwater withdrawals using water-measuring devices instead of estimated numbers in areas where it’s not currently required by other laws. But some wells would be excluded from the reporting requirements, including those that withdraw less than 10 acre-feet of groundwater per year. And people who take out water for irrigation purposes won’t have to use a water-measuring device or make annual reports if they use the water on their own land that’s less than 10 acres. Currently, there is a way for the state to designate a location as an “irrigation non-expansion area” where people can’t start irrigating more than two acres of land unless it was already irrigated for the five years before the designation began. Laws now allow the DWR director to determine if an area should receive this designation if there’s an insufficient supply of groundwater. But the director can’t look at projected future increases in groundwater withdrawals, including population or agricultural growth, when making the determination. 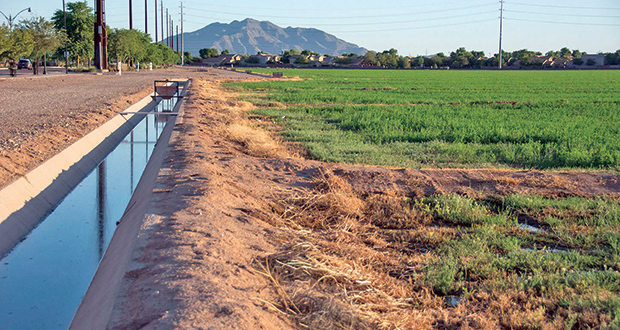 The issue arose in 2015, when the San Simon Valley area in Cochise and Graham counties sought a designation as an irrigation non-expansion area. The department said there was not enough evidence to designate the area as such, but there were problems in the process based on statutory requirements, the state says, leaving the state open to being sued. To fix the issues that arose, the state proposes changing language to make sure it’s clear who can irrigate, who can petition for the protected status, if public hearings are required and set a one-year time period for making a determination. The proposed changes also call for amendments to allow DWR to consider evidence of future projected groundwater withdrawal when making a determination.